Ten years of pregnancies and grief, months of near starvation—and then not even a full two years with us. We wanted her to have more bright mornings, more lazy afternoons, more interesting evenings—just more days, period. 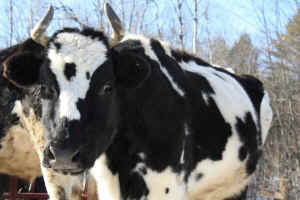 Rosetta arrived at VINE in early 2012, one of a group of cows who barely survived starvation at a small Vermont farm where they had been exploited for “dairy” for at least ten years. By the time they were seized by authorities, one of their friends had starved to death. At VINE, Rosetta and her friends Blake, Addison, and Fennel soon recovered their strength. By the summer of 2012, they were healthy enough to roam the hilly back pasture, which they quickly made clear was their favorite place. This past summer, Rosetta and her companions were able to spend even more time in that special spot, often electing to sleep high atop a steep slope or deep in the woods rather than retiring to the barn for the night. We close off that pasture in the winter, because the steep slopes become too icy. Rosetta came down to the front pasture reluctantly, but soon developed a new routine, napping under a favorite tree most afternoons and then coming up to observe all of the interesting activities at closing time, when she might watch Kathy tending to ALFie and Maddox, Cheryl navigating the cacophony of ducks and geese dodging in and out of coops, or pattrice tucking in the Kaporos survivors for the night. At some point after Rosetta laid down for her usual rest Wednesday night, she woke and found she could not get up. At sunrise on Thursday morning, we found her lying down, in obvious distress. We covered her with blankets and warmed her with our bodies until the vet arrived to confirm what we already had determined—no sign of injury or bloat, too weak to even try to get up, something going very wrong and not getting better inside. We all agreed: euthanasia was the only compassionate choice. As first Cheryl and then the vet examined Rosetta, many of the cows in the front pasture came by to nuzzle her—whether offering comfort or saying goodbye, we cannot say. As the vet examined Rosetta, pattrice rushed up to do the usual morning head-count of the back pasture cows. She saw this: All 21 cows were standing by the gate closest to the front pasture, in silent pairs and small groups, their heads oriented toward the front pasture. Even the most gregarious among them paid pattrice no mind, so intent were they on what can only be called a vigil. Rosetta died with Cheryl cradling her head, pattrice embracing her heart-to-heart, and Kathy watching over from nearby. The necropsy revealed an extremely enlarged heart that had compressed her lungs and impinged the vagus nerve—with that nerve blockage probably being the cause of the acute crisis. 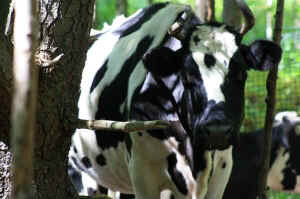 A “natural” cause of death, then, for a cow her age. Nothing we could have known about and nothing we could have done. And so our grief today is, for the most part, the pure grief of losing somebody you love and of knowing that others you care for are mourning too. At the same time, we also feel so sorry that Rosetta did not have more time at the sanctuary, where she so clearly enjoyed both the environment and her relationships. While the cause of Rosetta’s death was natural, the course of her life was anything but. Ten years of pregnancies and grief, months of near starvation—and then not even a full two years with us. We wanted her to have more bright mornings, more lazy afternoons, more interesting evenings—just more days, period. Listen: Everybody always says this, but it’s really true. Especially but not only with elders, you never know when somebody’s last day is coming. Try to seize every opportunity to express your affection for those you treasure. If you would like to help us do that for the cows who showed their affection for Rosetta on her last day, add the word “Rosetta” to the “special instructions” when making a donation, and we’ll be sure to share your condolences with them and with the staff members whose hearts are heavy today.